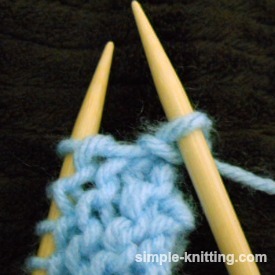 Joining yarn is a simple knitting technique for adding a new yarn ball. And since there are so many ways to do it I'm just going to show you how I do it and then you can try. That way you won't have to worry when it's time to change that ball of yarn or even if you would like to change colors. It's really easy. You may find a knot in your yarn. This happens and the best way to deal with any knot is to cut it out. More about this in a minute. There may be times that you find some sort of a knot in your yarn. Don't knit them. 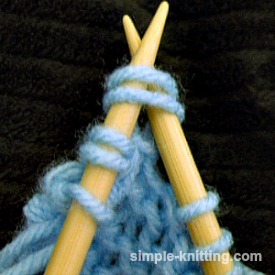 The problem with knitting knots is that they always seem to make a grand entrance on the right side of your work. And it never fails, that knot will probably be right smack dab in the front where everyone can see it. The other problem is that some knots even though they may seem really tiny are just holding the two ends together ever so slightly. And when you tug on the ends it comes apart. If you knit it more than likely it'll start coming apart particularly after a couple of washes. 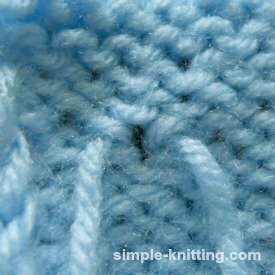 The best advice is, when you come across a knot, cut it out all together and then use the following knitting technique for joining yarn. It's one of the best ways to deal with it. In this photo I want you to see the layout for joining yarn because it can be confusing on just how to start the new yarn. The new yarn end will be lying along the left side of the left needle. Leave 3 - 6 inches for the new yarn as well. 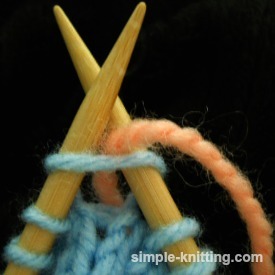 The old yarn end is lying on the right side of your right knitting needle. Make sure to leave about 3 - 6 inches so that you can weave it in securely. 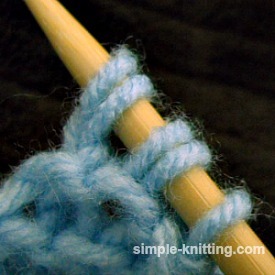 This knitting technique works for knitting in the round on circular needles as well. The only difference of course is that you don't have an end of the row. In this case I'll try joining yarn close to where a seam might be like under the arm or even off to the side a bit. That way it's not right in the spotlight where the eyes focus. Of course being able to position where you'll be joining yarn isn't always a choice, after all it's knitting. Stuff happens so just work the join carefully that's all. 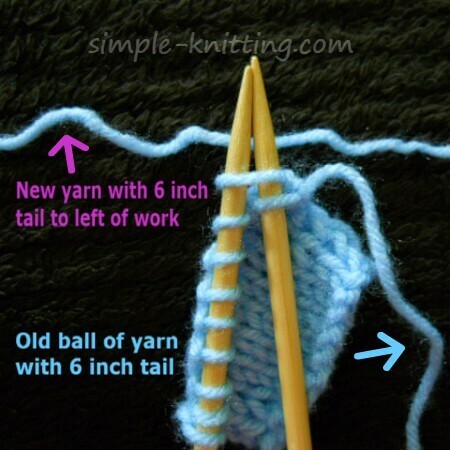 Grab the tail end of the old ball of yarn and the new yarn and wrap both yarns around the right needle and just knit it. 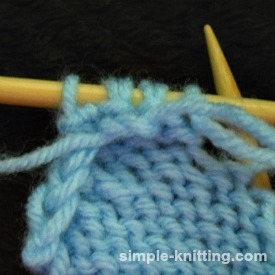 Knit the next stitch the same way using both yarns. Don't worry if the stitches get loose, it'll be okay. And you can fix it a bit in a minute. 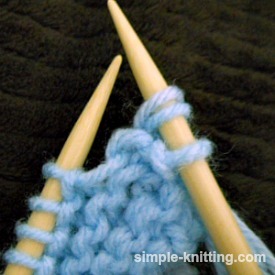 Knit two or three stitches and drop the old yarn end and continue knitting with the new one. Once you have worked a few more stitches stop knitting. Turn your knitting over. 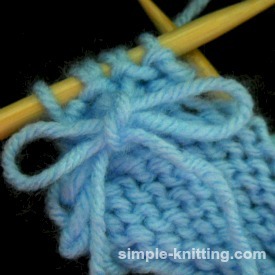 To help secure both yarn ends until your finished knitting just either tie a half knot as in the first photo or tie a bow. That way the ends will be a little more secure until you're ready to weave them in. The turn your knitting over. Continue on with your knitting to the end of the row. 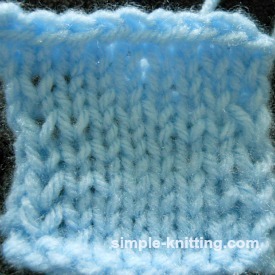 Begin next row by knitting or purling depending on whether you're knitting stockinette stitch and knit across to where the join is. It will be the double stitch of old and new yarns. 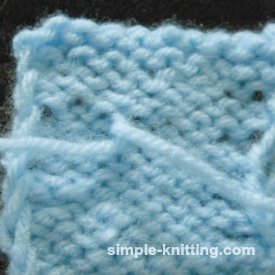 Make sure to knit the double stitches as one stitch. In the photo I began to knit the stitch in order to show you. And you're done. So what happens if you're changing yarn colors? No problem. Knit up to where you want to add your new yarn color. Drop the old yarn and just start knitting with the new one. The stitches will be loose but you can fix them in a minute. Knit a couple more stitches, then stop knitting, turn your knitting over and tie a half knot or bow just like we did above with the same color. That way the stitches won't feel so floppy. 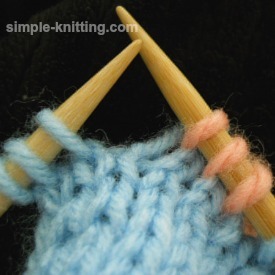 Are you wondering just how to sew up the joins when you're finished knitting? Have a look at the back of my knitting. This is where I added a new ball of yarn and how I will close up the little holes. OK, so there's a hole. 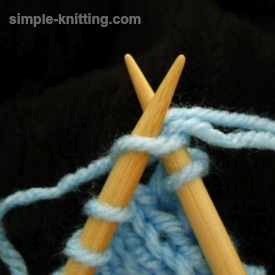 Take the two yarn ends and twist them both around one whole turn. You may need to adjust the tension of your stitches and fiddle with it a bit until it's right. Then just weave in the ends. 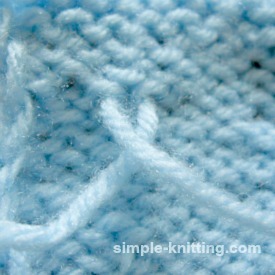 The same color yarn ends will go in the same color part of the fabric if you have different colors. 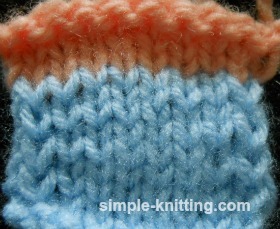 Here is the end result of the same color yarn and I don't think you can even tell where the joins were right? And here is the finished swatch with the new color. Just in case you'd prefer to watch how it's done I found two great knitting videos, one is using the same color yarn and the other is adding a new color.